Review: Beth Steel’s Wonderland. Nottingham Playhouse. – East Midlands Theatre. 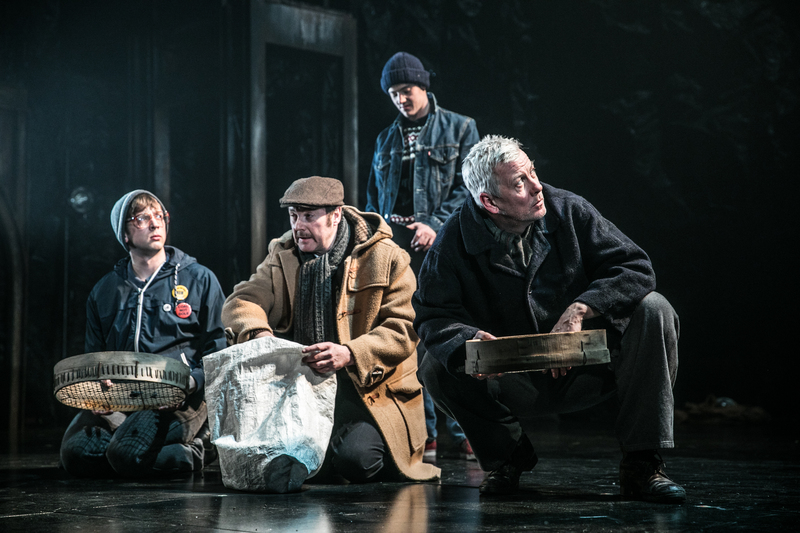 On its exciting regional premiere, Beth Steel’s play Wonderland, set in the years 1983-85, during the onset of the miner’s strike, is a theatrically gripping and absolutely ripping success on the Nottingham Playhouse main stage. As artistic director, Adam Penford’s superbly directed inaugural play for Nottingham Playhouse, is going to have its audiences in heated debate throughout its February run and even beyond. Dually thrilling is seeing real working class folk, like moi, depicted on stage and the fact that we have two female playwrights, Beth Steel and Jane Upton at the forefront of Nottingham Playhouse’s new programming. 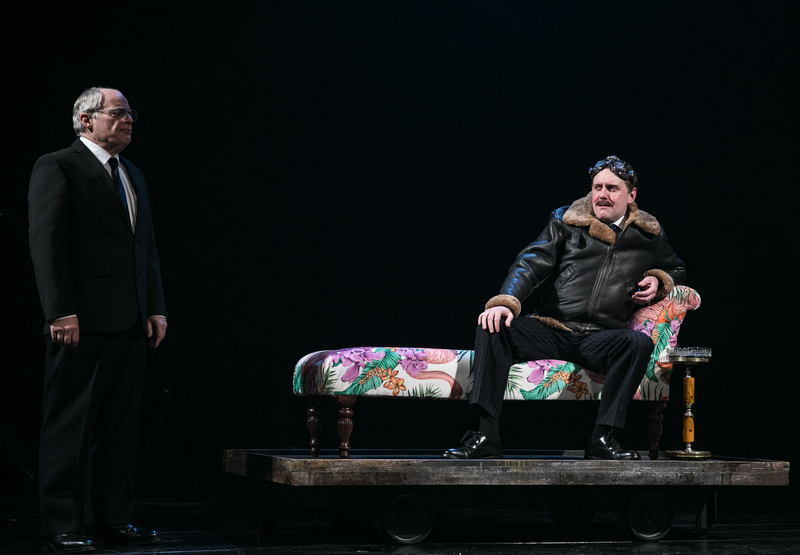 Beth Steel’s intelligent and super informed twenty-eight scene Wonderland play is perfectly seamless in this Nottingham Playhouse production. This play is highly dramatic, has dark humour throughout and is emotionally redolent of a vastly difficult time in history when the country was in deep economic crisis. The very idea of a job for life down the coal pits was blown wide apart as were entire UK coal mining communities. Given that a fair proportion of the story is set at the Nottinghamshire Welbeck Colliery and, that many former miners and their families are in the audience tonight, there is palpable support for the actors playing the miners in Wonderland. During a miner’s speech about dignity and pride in work the sentiment receives a spontaneous round of applause. Coming from a coal mining family herself playwright Beth Steel has plenty to be proud of in this importantly human and diversely political play. 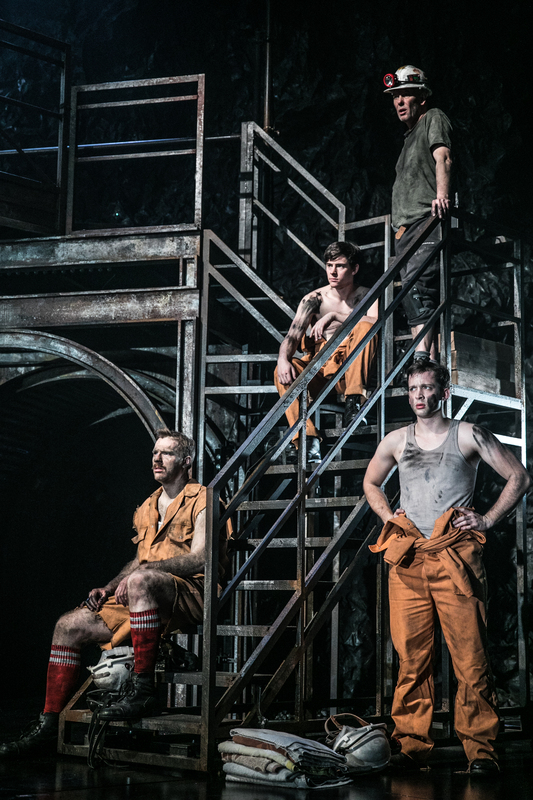 The Wonderland set designed by Morgan Large is a wonder in itself; multileveled, highly evocative of the interior of a coal mine, black as thunder with ghostly blue lighting and imaginatively enkindles brief physical evocations of other exterior locations. Jon Nicholls’ soundscape adds great mood and tensions and some cracking special sound effects. The lighting design (Jack Knowles) is incredibly strong and helps define even further the structure and locations of each scene. 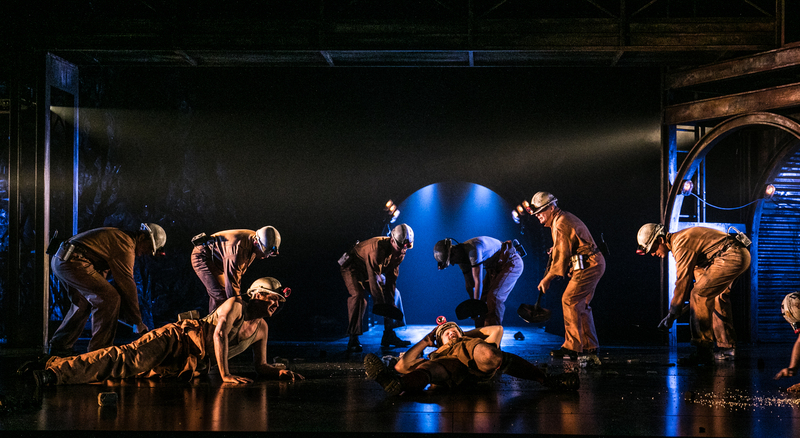 Tremendous care and attention to detail has been made in the costuming of Wonderland and the costume design by Morgan Large has been helped by generous loans of original mining equipment including helmets, harnesses and snap tins. 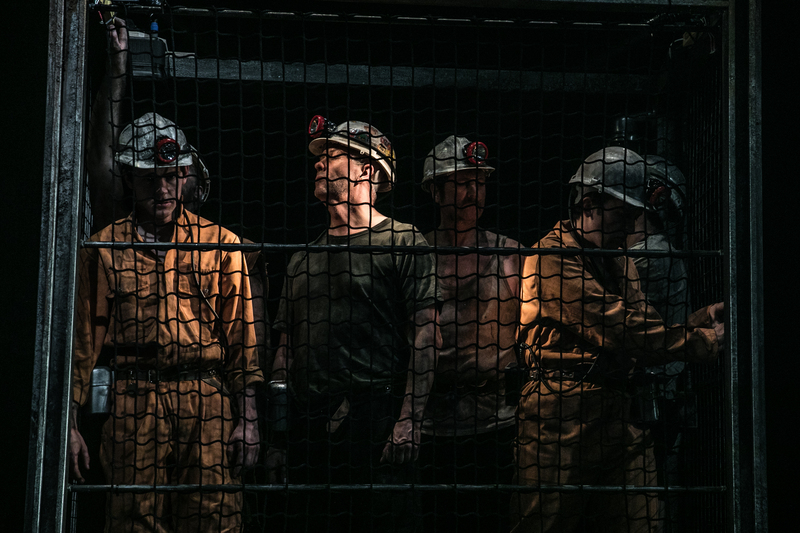 The glistening sweat of the actors playing the miners – is very authentic. The story begins in Nottinghamshire in 1983 and we meet two young sixteen year old lads for whom it is their first day working down the coal mine. As part of their job spec they will be given labour intensive jobs as waggoners or hurriers. The hard graft involves pushing wagons of coal through the mine to the coaling face. Historically, hurriers were sometimes called coal drawers or coal thrusters. In the past children and women were employed by the collier to shift the coal they had mined. 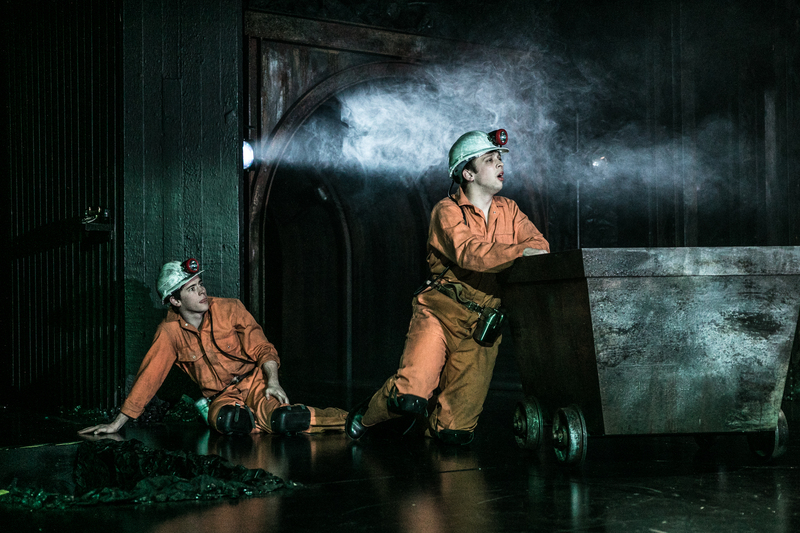 As the teenagers, Malcolm (Chris Ashby) and Jimmy (Joshua Glenister) are initially nervous but soon learn to be part of the banter and brotherhood of the older miners albeit warned against their naïve eagerness to be cutting coal in dangerous and searingly hot conditions. They meet the charismatic Colonel (Deka Walmsley) who tells them that they need a healthy attitude to work, learn common sense and have a willingness to do back breaking graft. 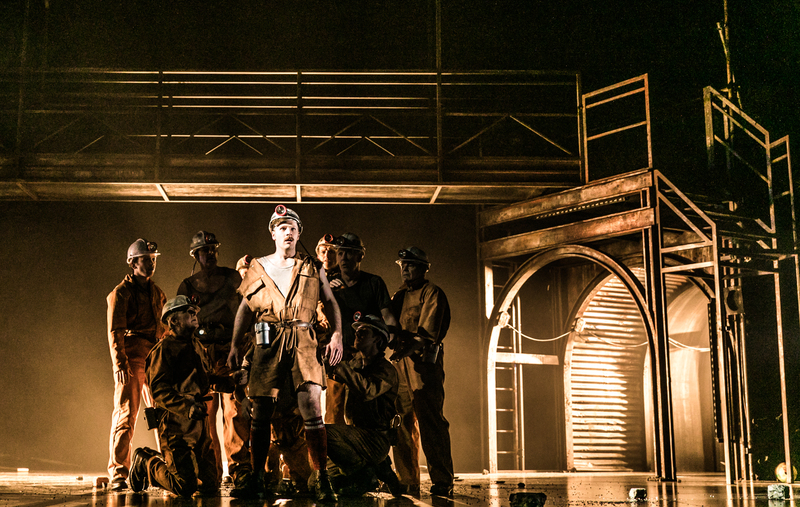 Beth Steel’s dialogue is pure Notts and the production includes songs such as ‘Collier Lad’ and ‘Blackleg Miner’. An American CEO known as Ian ‘The Butcher’ MacGregor is brought in to reform King Coal. Alarmingly, pits start to close and a national miners’ strike is called. Peter Walker, a Tory MP weakly attempts to combat his leader’s hard line ideology and an eccentric fop called David Hart (Jamie Beamish) is called in to break up the strike. 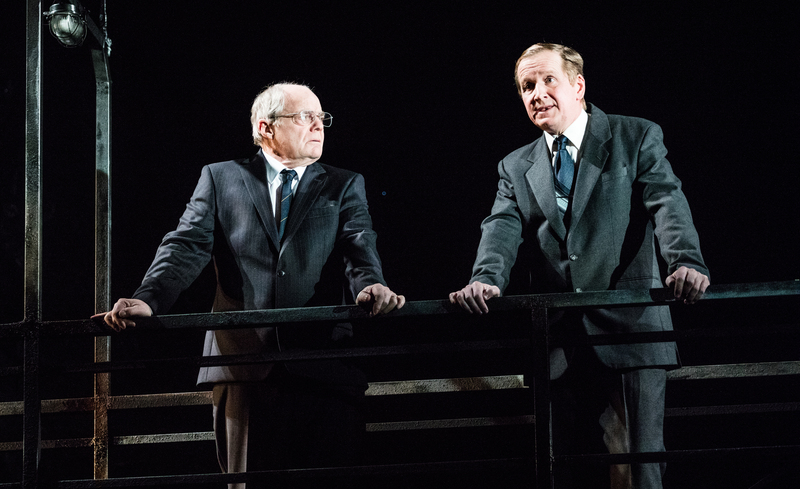 The politics and tactics of Peter Walker (Matthew Cottle), Ian MacGregor (Robin Bowerman) and David Hart make the blood run cold. Cracks appear on all sides as the embattled miners are torn apart trying to protect their livelihoods and families. 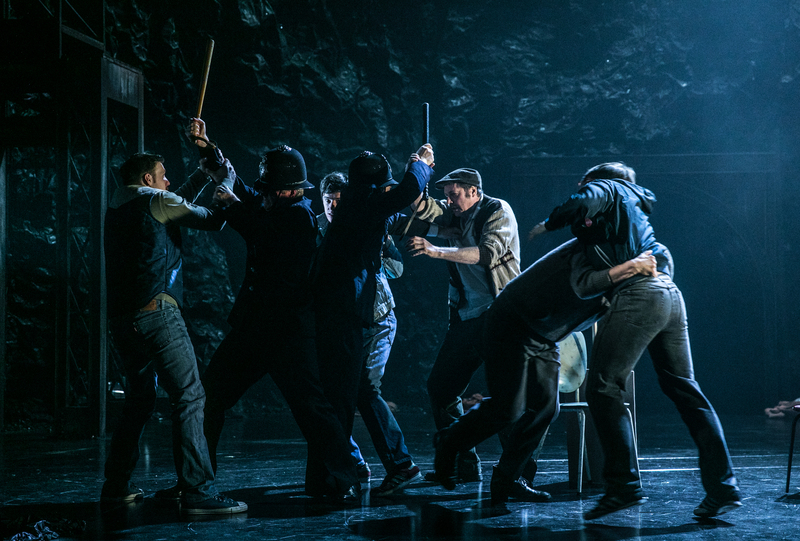 The violent scenes at Orgreave are skilfully done and whilst we are not witnessing thousands of miners and police battling on stage, the fight choreography by Naomi Said is frighteningly realistic. Many human casualties occurred during the strike period and in the play a very emotional moment occurs when Malcolm confesses he had to kill his pet dog as he couldn’t afford to feed her. In the larger political picture Maggie Thatcher and Arthur Scargill President of the National Union of Mineworkers, don’t appear represented on stage but their presence is certainly strongly felt and referred to. Beth Steel cleverly weaves in other political and terrorist atrocities happening at the time to build on the tensions. The beauty of this production is in the all male ensemble playing. Often, multiple principle roles are taken on by actors such as Jamie Beamish and Nicholas Khan. The acting standards overall are top notch and very believable. 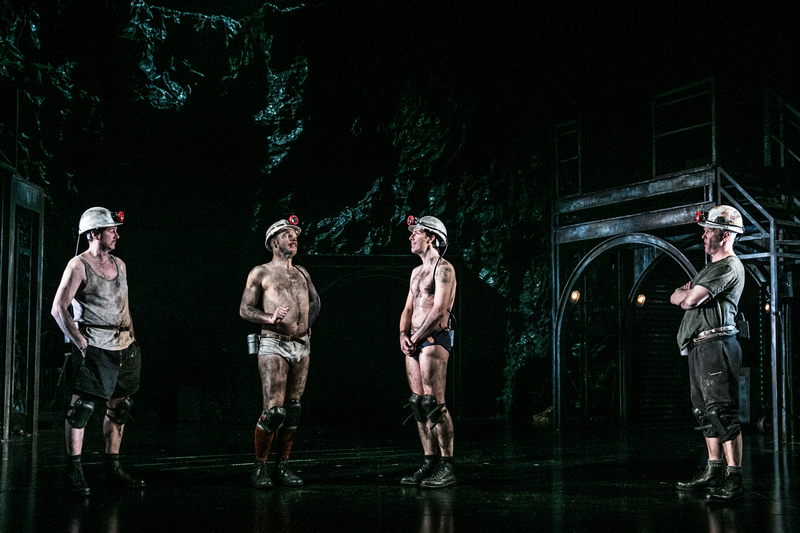 Wonderland captures the camaraderie of the coal miners, the support they offered each other in work conditions and during the intense strike period. Plus, we witness the deep antagonism caused by any miners – sometimes former friends – breaking the strike conditions and being hated and labelled ‘scabs’. Additionally, we are humanly compatissant as we see the desperate miners scrabbling for scraps of coal to heat their houses. Aside from being human subjects for this dramatic stage play, the fact that the creative inspirations come from real life events makes Wonderland so much more powerful than a fictional story. Fanny’s (Jack Quarton) poetic speech full of pride and graphic detail at the end of the play is a real lump in the throat tear jerker. Nottingham Playhouse’ s Wonderland is explosively raw theatrical story telling at its gritty best. 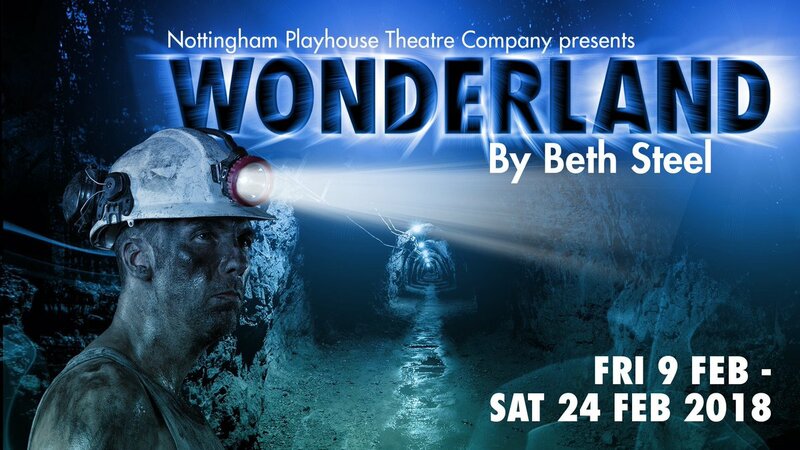 Wonderland runs at Nottingham Playhouse until Saturday 24th February. Thanks for the opportunity to see this play Phil. I found it absolutely riveting from start to finish. I must admit that at times I cried with laughter and was saddened over the inevitable tragedy at the death knell of the end of the mining industry. Which, if we think about it, forged us as one of the world’s foremost industrial nations. It portrayed the mining communities almost caught up in a mini civil war. Absolutely fantastic! Thanks again Phil.